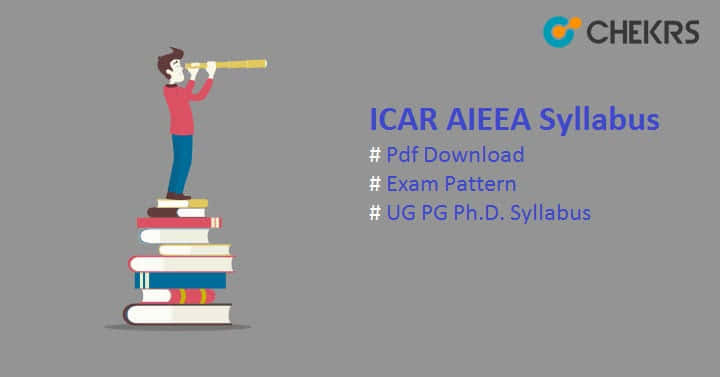 ICAR AIEEA Syllabus 2019: ICAR AIEEA UG, AIEEA PG, and AIEEA Ph. D conducts separately to provide admission in various degree courses in the field of agriculture. To get admission into these courses candidates have to qualify the examinations. All the Candidates who are interested in the offered courses have to qualify the ICAR AIEEA 2019 Examination. To Qualify the Examination Candidates will need ICAR AIEEA Exam Pattern and Syllabus so in this article we are providing all the Preparation related stuff. There are separate Exam patterns for UG, PG and Ph.D. Programs. Thus we are providing the same for each of the programs in these tables. For PCM Group: Physics, Chemistry, Mathematics. For PCA Group: Physics, Chemistry, Agriculture. For ACB Group: Agriculture, Biology, Chemistry. Marking Scheme 4 marks for every correct response & 1 mark will be deducted for every incorrect answer. ICAR AIEEA Paper Pattern for PG One question paper for each of the 20 major subject-groups, which includes 150 multiple choice objective type of questions, and 10 cross-matching type questions, each having five sub-questions for every subject-group paper. Marking Scheme Correct Ans. Wrong Ans. The Exam authority provides ICAR AIEEA Syllabus through their official website. You can follow the link which is given at the end of the post or through the tables given below. Some Basic Concepts of Chemistry, Solid State, Solutions, Structure of Atom, Classification of Elements and Periodicity in Properties, Chemical Bonding and Molecular Structure, States of Matter: Gases and Liquids, Thermodynamics, Equilibrium, Redox Reactions, Hydrogen, s-Block Elements (Alkali and Alkaline earth metals): Group 1 and Group 2 elements, Preparation and properties of some important compounds, Some p-Block Elements: General Introduction to p-Block Elements: Group 13 elements, Group 14 elements Organic Chemistry: Some Basic Principles and Techniques, Hydrocarbons: Classification of hydrocarbons, Electrochemistry, Chemical Kinetics, Surface Chemistry, General Principles and Processes of Isolation of Elements, p-Block Elements: Group 15 elements, Group 16 elements, Group 17 elements, Group 18 elements, d and f Block Elements, Coordination Compounds, Haloalkanes and Haloarenes, Alcohols, Phenols and Ethers, Aldehydes, Ketones and Carboxylic Acids, Organic compounds containing Nitrogen, Biomolecules, Polymers, Environmental Chemistry and Chemistry in Everyday life. The Living World, Unit of Life, Diversity of Life, Organisms and Environment, Multicellularity : Structure and Function-Plant Life, Multicellularity : Structure and Function-Animal Life, Continuity of Life, Origin and Evolution of Life and Application of Biology. Sets and Functions, Algebra, Coordinate Geometry, Calculus, Vectors and Three-Dimensional Geometry, Linear Programming, Mathematical Reasoning, Statistics & Probability, Statics and Dynamics. Agrometeorology, Genetics and Plant Breeding, Biochemistry and Microbiology, Livestock Production, Crop Production and Horticulture. Animal Husbandry/Dairy Sci, Animal Genetics & Breeding, Animal Nutrition, Vety./Animal Physiology, Livestock Production Management, Livestock Products Technology, Poultry Science, Vety. & Animal Husbandry Extension, Livestock/ Veterinary/ Animal Husbandry Economics and Bio-Statistics. Veterinary Parasitology, Veterinary Pharmacology and Toxicology, Veterinary Pathology, Wildlife Science/ Wildlife Health Mgt., Vety.Virology, Vety. Immunology, Veterinary Microbiology & Immunology/Bacteriology, Veterinary Surgery & Radiology,Veterinary Anatomy/ Veterinary Anatomy & Histology, Veterinary Gynaecologyand Obstetrics/Ani. Reproduction, Vety. Medicine (Clinical/Preventive), Veterinary Public Health & Epidemiology/Vety. Public Health/Vety.Epidemiology/ Vety. Epidemiology & Preventive Medicine. Soil & Water Conservation Engg./Soil & Water Engg., Irrigation Drainage Engg,/Irrigation Water Mgmt.Engg., Post Harvest Technology/ Processing and FoodEngg., Farm Machinery and Power Engg. And Renewable Energy Engg. Agricultural / Agro. Meteorology, Soil Science & Agricultural Chemistry/ Soil Conservation and Water Management/ SWC/ Irrigation and Water Management, Agricultural Physics, Agricultural Chemicals and Environmental Science. Plant Breeding & Genetics, Plant Pathology, Agricultural Microbiology/Microbiology, Seed Science & Technology and Plant Genetic Resources. Plant Biochemistry/ Bio. Chem., Plant Biotechnology & Molecular Biology/Biotechnology and Plant /Crop Physiology. You can download the complete syllabus from the given link. The Syllabus is based on 2018 Syllabus so visit the official site aieea.net as well as our site for the updates information. After getting the complete syllabus and Understanding the exam pattern. Now it is time for preparations. So Try your Best and Do Well. Keep Visiting.